Clint Eastwood’s dramatization of the 2009 flight that ended with an emergency landing in the Hudson River carried with it an inherent challenge. How do you tell a story in which we already know the ending yet maintain the drama and the conflict long enough to sustain a feature length film. Eastwood tries to do so by establishing several conflicts, and opening the film with a curveball. Rather than begin with the flight sequence, Eastwood fakes out the audience with a dream sequence. Soon after, he reveals the incident has already taken place. For a film that has been accused of running on autopilot, Eastwood plays with structure in interesting ways. There are a handful of flashbacks and the occasional dream sequence. They effectively establish the central character, his past flight experience, and his growing doubt over the decision he made. Tom Hanks turns in another strong performance that effectively carries the film. He’s known as the consummate professional able to portray the everyman in dire situations. As such he was the perfect choice to play Chesley 'Sully' Sullenberger in this tale of experience and professionalism prevailing despite the odds. The main conflict involves Sully and the failing aircraft, but that’s the one we know the ending to. So Eastwood finds conflict in meetings with the NTSB. The primary members -played by Mike O'Malley, Jamey Sheridan and Anna Gunn- are said to be “just doing their jobs.” But they come across as obvious villains out to get Sully for unknown reasons. Their investigation, rather than coming across as something they're reluctantly required to do, feels like something they want to do. Their motivations never become clear, but we suspect them from the start. Perhaps it’s the slightly over-the-top way they’re portrayed, but they are one of the weaker elements of the film. They do, however, effectively instill doubt in Sully. His far more interesting conflict is one of ever growing self doubt. Watching Hanks silently battle through it ends up being the strength of the film even if it does, at times, feel like padding to stretch out the runtime. In all these things Sully is portrayed as the steadfast pinnacle of professionalism, and he uses it against all his various conflicts. His confidence in his experience, his knowledge and the simple fact that “we did our jobs,” is admirable. But it's watching that confidence begin to fray that drives the film. Aaron Eckhart plays Sully’s co-pilot, Jeff Skiles. He doesn’t have a lot to do, but he’s effective as the supporting role. He trusts wholeheartedly in Sully and stands by his side the whole way. Laura Linney, on the other hand, is completely wasted as Lorraine Sullenberger, the supportive but constantly worried wife. She gets to take part in a couple of phone calls that feel entirely obligatory. They simply give voice to the inner struggle we already know is going on. As for the crash and subsequent sea rescue, true to the theme, it’s handled with technical efficiency rather than anything flashy. Even the rescue workers are given lighthearted intros to establish them as ordinary folks. But once the call to action arrives, professionalism saves the day. Do these various conflicts sustain the runtime? For the most part they do. It's thanks in large part to Hanks' performance, but "Sully" works in other ways as well. In much the same way their survival lifted the spirits of a city in need of good news, Eastwood gives us a positive story of calm professionalism in a time of need. We could all stand to learn from the calm professionalism here. Maybe more importantly we can all admire the professionals and rescue workers whose experience and calm demeanors in tough situations make all the difference. “Sully” isn’t a flashy film that takes chances. It’s an example of technically efficient filmmaking. And that’s perhaps precisely the sort of film it needed to be. 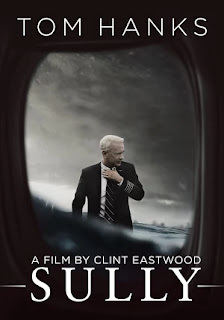 The way Sully calmly did his job with confidence, is mirrored by Eastwood’s approach to filmmaking. It might be simple, but it’s effective.